The Lady Ducks made a statement in Sunday’s game against the No. 19 Stanford Cardinal. 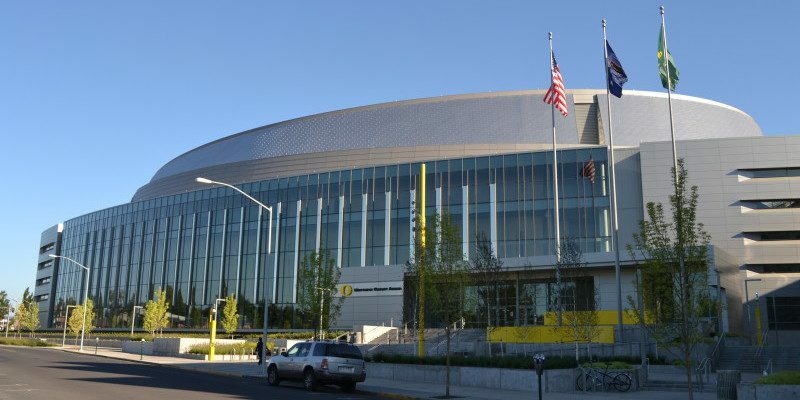 Matthew Knight Arena was buzzing after Oregon pulled off the upset, defeating Stanford 62-55 in the Ducks’ senior game. The win added to the Ducks’ 13-16 (6-12 Pac-12) record going into the Pac-12 tournament this coming Thursday in Seattle. With their huge win over Stanford the Ducks will be seeded as No. 10 going into their first game of the tournament against the No. 7 seed Washington State Cougars. The Ducks’ senior night started out appropriately as senior guard Katelyn Loper drained the first basket of the game. The team continued its early success by going on a 7-0 run, until Standford’s Bonnie Samuelson scored a three-pointer for the Cardinal’s first basket of the game. 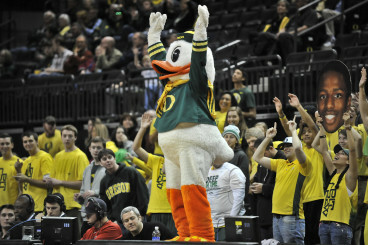 Puddles celebrates as the Ducks score. Oregon finished first half strong, ending with a Field Goal percentage of 40% as opposed to Stanford shooting 35.3% to end the half. The Ducks went into the locker room leading the Cardinal 30-29 at half. Junior forward Jillian Alleyne led Oregon with 13 points in the first half, followed by Loper who bucketed six points before heading to the locker room. Alleyne went on to lead the Ducks for the night by scoring a total of 22 points and 12 rebounds. Behind her was junior guard Lexi Peterson, who drained 11 total points. The Ducks finished the game shooting 41.1% from the field, and shooting 73.3% from the free-throw line. The Cardinal trailed the Ducks when it came to accuracy by shooting 35.8% from the field, and 50% from the line. Oregon’s seniors showed up to play in their final game in Matt Knight Arena. Loper finished with 9 points, 7 rebounds, and one assist. She wasn’t the only senior doing the scoring, senior guard Amanda Delgado scored 10 points, two assists and had one rebound in Oregon’s victory on Sunday. The Ducks wrapped up their 2015 season the right way by bringing home a win in their final game at Matt Knight on Sunday. Oregon looks to bring this momentum into the Pac-12 tournament later this week against the Cougars on Thursday.